I was rejected today. It wasn’t personal and it probably wasn’t even about me. But I’m disappointed, and discouraged, and I made my husband go out and get me a carton of Ben and Jerry’s. I know, it’s horrifying to me too… those tiny little containers hardly have any ice cream in them. A thrifty, Brethren gal like me would normally steer clear, but it seems like the kind of outrageous splurge that girls are supposed to make when we get dumped. It’s in all the movies. And who am I to question pop culture? I never actually went out with that special boy. I didn’t work up the courage to talk to him and I didn’t ask him to the dance. I didn’t even know his name. But I wanted to be his Mom. About three weeks ago our social worker e-mailed us some information about him and we were intrigued. He could be “the one”. Even Glen was excited about the possibility – his emotions when it comes to adoption usually range from tolerance to mild acceptance. This seemed like such a good match. She passed our homestudy along and we were being considered. It was early days – we knew that. We were flirting with the possibilities, not making plans. We didn’t even tell our kids about it. But I started to imagine a jungle themed bedroom. And I may have peeked at the “boys” section in Wal-mart, something I’ve only ever done for nephews and friend’s children. I opened my heart up, just a little bit. So when they chose another family we weren’t devastated, but we sure are disappointed. I wonder if we will lose a little piece of our heart each time. Because this is how it works. It’s like a bizarre dating service with extensive questionnaires, personality profiles and government appointed yentas (a.k.a – social workers) trying to find the perfect match between child and family. So here’s us, still waiting for that special someone. This entry was posted on Wednesday, August 24th, 2011 at 7:46 pm	and tagged with adoption, rejection, waiting to adopt and posted in adoption. You can follow any responses to this entry through the RSS 2.0 feed. He’s definitely my go to guy right now. Thanks! When I was dancing with him at VBS yesterday B had a dramatic jealous meltdown – definitely a sign of things to come. I’m just glad that you have the good sense to be my friend, despite your apparent bad taste in other areas. 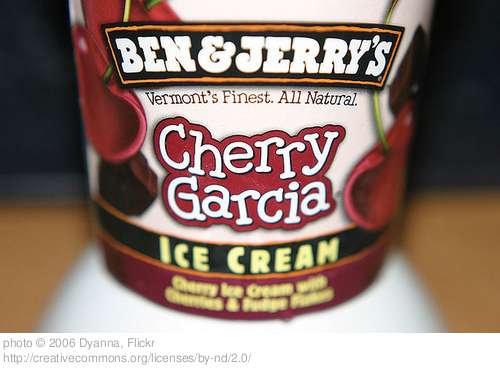 Cherry Garcia is the ONLY way to go! sorry to hear that Christy. Thanks for sharing some of the emotions that go along with the adoption journey. I’m currently listening to Russell Moore’s “Adopted for Life” audiobook and I have been convicted in many areas of my thoughts towards adoption. I don’t know yet if it will be in store for our family, but many friends are adopting and I am thankful for the opportunity to walk beside them. It is tough! Thanks guys – I’ll have to take a look at that book. It’s definitely a learning curve and we’ve barely begun. Sorry to hear about your disappointment. Are you adopting through the ministry or privately? We are adopting through the ministry – a child ages 0-3 hopefully. It’s quite the process, but we sure are learning a lot. You WILL lose a little piece of your heart each time… but it WILL be worth it! Thanks for talking to me about this – I know you’ve been through it several times. Little C is definitely worth all the heartache you went through.